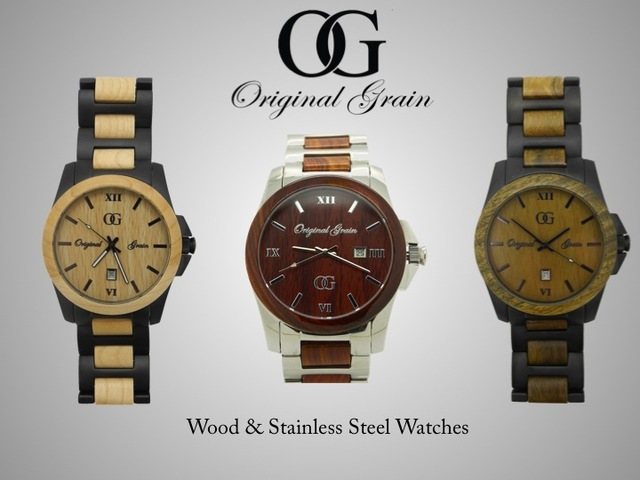 Original Grain Watch brand knocked on the wooden door of Kickstarter seeking a pledge goal of $10,000 and gained instead pledges in the amount of $348,404! Talk about timely kindling – this brand is on fire! 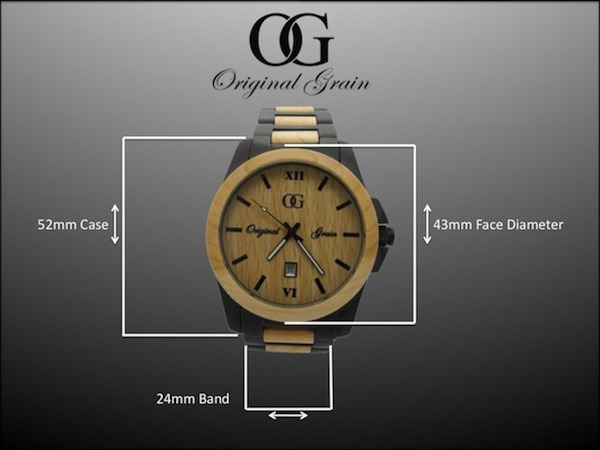 Original Grain is the passionate brainchild of Ryan Beltran who started the brand out of his simple desire for watch product design and his love of watches. Beltran attributes his budding watch designs on two locales, his home of Pacific Northwest and Hong Kong where he lived for the past two years. Beltran simply wanted to design a watch that integrated both the elements of nature and metal having the substantial weight of a heavier timepiece, not present in many wooden watches currently on the market. Beltran and the Original Grain design team invested a year in the design of the Original Grain watches and sought out watch industry professionals to carefully design prototypes that would best articulate the desired aesthetics for the Original Grain watch. This design articulation is presented in a ready for release first collection. 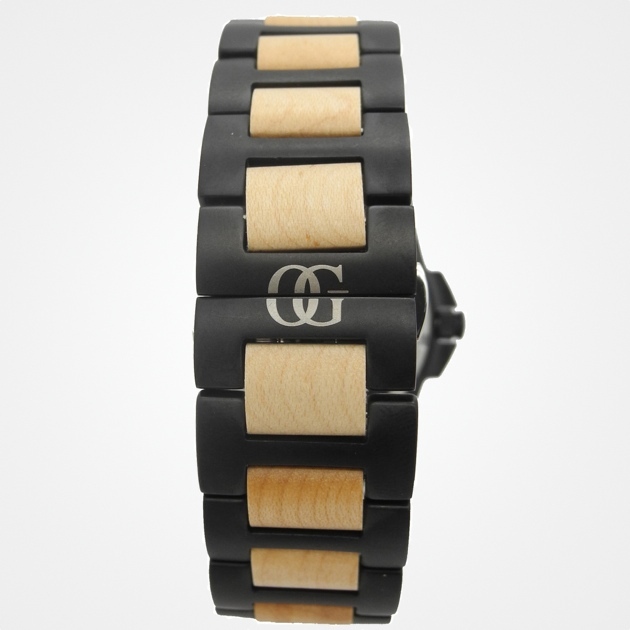 Original Grain’s 100% wood grain design is visibly displayed by its inner wooden bracelet links, dial and bezel harmoniously embraced by a stainless steel case and bracelet. Three distinct models emerged, Maple, Indian Rosewood and Green Sandalwood. Each watch features a 52mm diameter case with a 43 mm diameter dial. The show cases Roman numeral at 12, 3, 6 and 9 o’clock and an analog date aperture at 6 o’clock (Maple and Green Sandalwood models) or 3 o’clock (Rosewood model). A stylish feature of the watch bracelet is its butterfly clasp that reveals the OG logo when closed. The Maple and Green Sandalwood model have a matte black stainless steel case and bracelet, versus the Rosewood model with a high polished stainless steel case and bracelet. With three finalized watches ready for distinguished consumers the question arose “How do we get it to production?” The answer – Kickstarter. As mention earlier the original pledge goal was $10,000, however, to date Original has $348,722 and 2,013 and counting backers as the project will fund Friday March 29 at 12:09pm. Despite being fully funded there pledge opportunities are still available at $5, $10 and $25. After the watches go into production it will be available for retail at $150. This Kickstarter watch opportunity knocked and people responded, “Come in, I want in on this opportunity!” Guess the old adage “time waits for no man” is indeed a true saying. 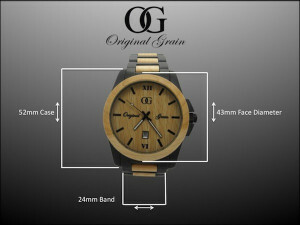 You can find more information about Original Grain watches on Kickstarter. Strong and dynamic, the Armani Exchange Chronograph Quartz Men’s Watch AX1183 could be the watch you need. With an athletic design, and quality interior, who says you can’t have it all? This watch is priced at $240, making it both desirable and affordable. The main colors on the watch are black, silver, and red. This lends solid, tough look. The watch face background is black with texturing.- the very center has vertical stripes, which are surrounded by vertical boxes. The black edge has tick marks to help represent the time. Encircling the watch face is a black ring. To distinguish the black face from the black outer ring is a red band. The red has silver tick marks delineating seconds as well. The flow of the colors gives the watch a race car themed style. The three sub-dials on the face are visually similar to a car dashboard, continuing the racecar theme. The silver tick marks are similar to speedometer marks. The dial has a second, minute, and hour hand- the second hand is red, and the minute and hour hands are silver. 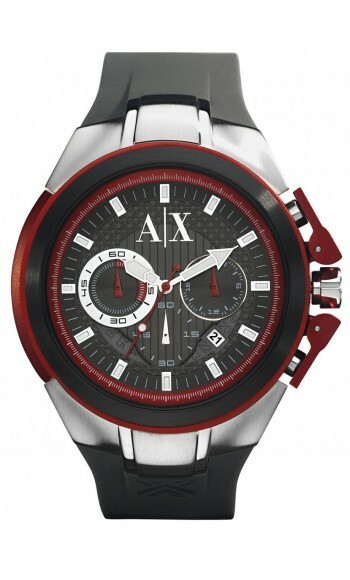 The Armani Exchange Chronograph Quartz Men’s Watch AX1183 wrist band is silver and black. The sleek look brings out a modern appeal. The watch’s band is imprinted with an X for their brand A|X. The knob on the side of the watch is silver surrounded by red adjusters. The watch also has a month display, which is displayed at the bottom of the watch face. The colors, designs, and features, make this watch bold, modern, and athletic. However, this watch may not suit all tastes. 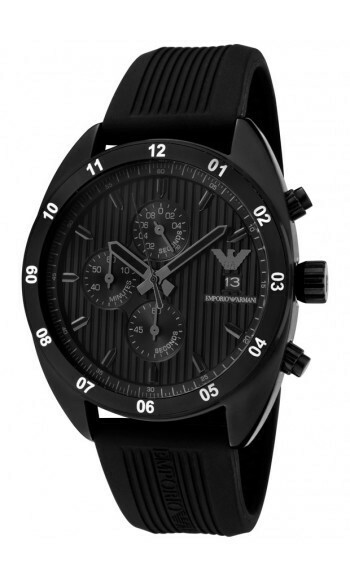 The Emporio Armani Chronograph Quartz Men’s Watch AR5928 also has a distinct, sporty look. The watch’s colors are simpler featuring only black and silver. The face, bezel, hands, and wrist band are all black. The numbers are distinguished by pulling out different shades of grey. The only white on the watch is on the bezel where hour markers are featured. This watch may suit those that want a tougher sport look, though it’s at a higher price point than the Armani Exchange at $375. The Armani Exchange Chronograph Quartz Men’s Watch AX1183 is a watch for athletes, gentlemen, and the financially considerate. Without breaking the bank, you can have quality, style, and functionality. Both Baselworld and the watch industry have come a long way since the days of the Swiss Watch Show during the early twentieth century. From April 25 through May 2, 2013, industry connoisseurs will gather at the world’s most popular timepiece convention. Baselworld: the World Watch and Jewelry Show, is like the start of the season for many jewelry manufactures because it defines the mechanical and stylistic tone for the rest of the year. Some top brands at Baselworld include Carl F. Bucherer, Patek Philippe, Roberto Coin, Omega, Rolex, Swatch and Rado, but a plethora of other fashion and jewelry designers will no doubt be in attendance. 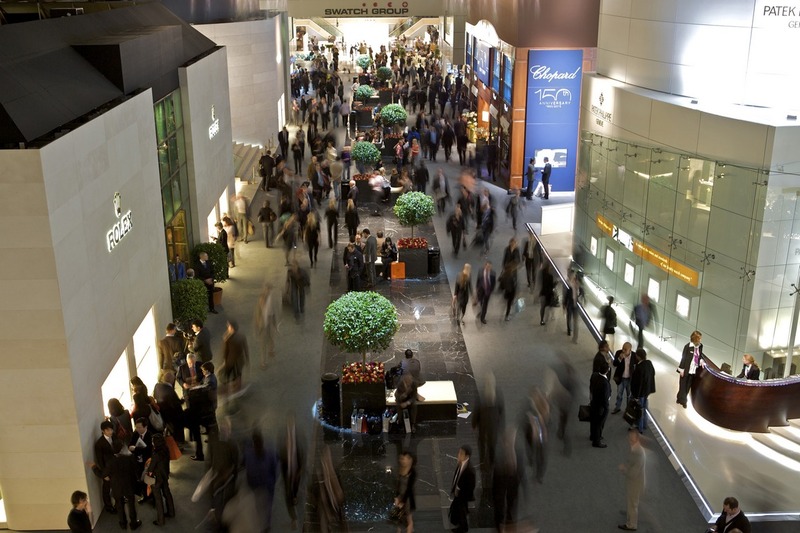 As the leading horological exhibition globally, Baselworld attracts timepiece marketers, traders, manufacturers, merchandisers and worldwide press to convene, view and buy the industry’s newest watches. Marc Alexander Hayek from Breguet calls the exhibition his “favorite week of the year,” and believes that many other leading figures in the industry feel the same way. Baselworld is a critical point in the year because it provides the backdrop for watch and jewelry designers to not only show where their brands are headed, but also to foster relationships with buyers. Thierry Stern of Patek Philippe points out that this week is where manufacturers display their hard work from the past year for the pleasure of others. Being in the epicenter of the watch industry allows CEOs such as Hublot’s Jean-Claude Biver to analyze where his company is in relation to other designers. “This is where we see, globally, all our clients,” Robert Coin said regarding the importance of getting to know your partners and customers. 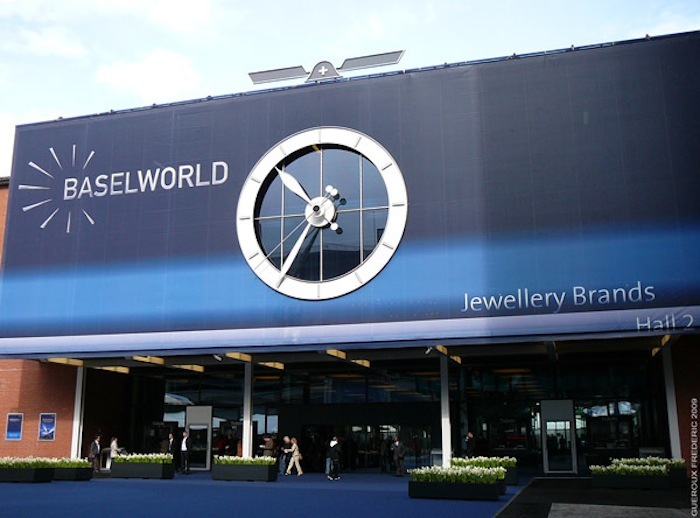 This year’s Baselworld will take place for eight days at the Exhibition Center Basel in Switzerland. Luxury watchmaker Tissot is celebrating their 160th anniversary this year by releasing their new Heritage Navigator Watch. The Navigator was a luxury watch originally released in 1953, but Tissot has taken to updating it to create an even more elegant piece. One of the most visible changes between the 1953 Navigator and today’s is the size of the case. Originally a small 36mm, it has now been made to measure in at 43mm. The Heritage Navigator has a stainless steel case with a beautiful black dial. The colors compliment each other so well, the band is also made from black leather. The dial has Arabic numbers and a multitude of city names. You have the ability to choose the city you want to know the time of and the bezel will show the time zone. The face is covered by a crystal glass and coated with a non-reflective cover so that you won’t face any glares. 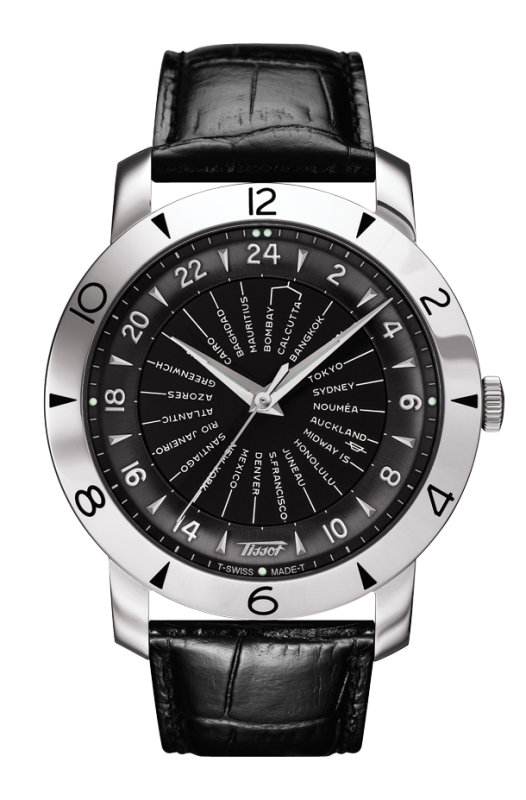 And if you choose to take it swimming, Tissot made sure to create a water resistant watch of up to thirty meters. The back of the watch is skeleton so that you can see the automatic chronometer movement. 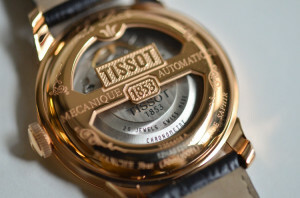 Tissot has yet to release a price on their new Heritage Navigator Watch. However, if you are looking for an updated classic piece, this is it. The Navigator is a luxurious watch that is also quite simplistic making for a beautiful timepiece. This is truly a watch that will last years and garnish compliments from everyone. 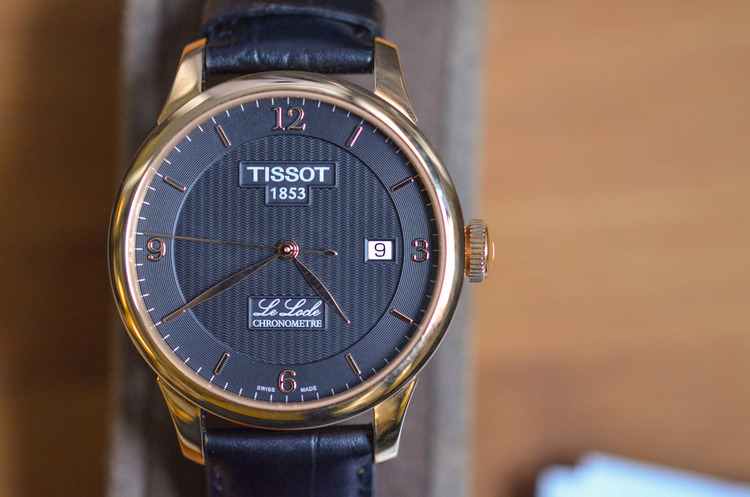 It may be Tissot’s 160th year, but our wrists are the ones celebrating. The deep beauty of Tissot’s Le Locle Chronometre. The Tissot Le Locle Chronometre is one star in a long line of proud timepieces that can boast of being named for the birthplace of Tissot watches itself. Nestled in the Swiss Jura Mountains, Le Locle is the small village where the first pieces were crafted in 1853. Now a century and a half later, Tissot has watches in 150 countries and is an established name synonymous with quality and style. One of the most remarkable things about this piece is found right in the watch face of the Tissot Le Locle Chronometre, where there is an incredible amount of detail. Finely chiseled guilloché pattern runs across the dial, and the color combination is quite striking. Framed in pink gold with a dark blue grey face, a look is created that is somehow both demure and dashing. Shining gold letters mark out the hours and a typical date window rolls by the days, perhaps the only mundane thing about this watch. The split sapphire display back is a bold aesthetic move, and one which some consider quite polarizing. However there is a way in which the style choice provides a appearance of treasure locked securely up, and treasure is just what is found at the heart of this Chronometre. Sleek movements can just barely be seen vaulted behind lovely pink gold that is decorated with an elegant scroll of embellishments for flair. The dimensionality of this case back also appears to add weight and depth to the watch, and thus further complexity. Complex movements vaulted in by embellished pink gold. This timepiece perhaps over them all truly honors the proud heritage that this brand has to offer. Produced to commemorate Tissot’s award for best chronometre with their 2012 Le Locle, this year’s model celebrates the highest caliber of watchmaking seen today, combining exceptional aesthetic appeal with excellent time keeping. It can stand alone as an ambassador for the brand and beacon of their success. Founded in 1881 in La Chaux-de-Fonds, Switzerland, Movado is a Swiss luxury watch company whose name is Esperanto for “always in motion”. 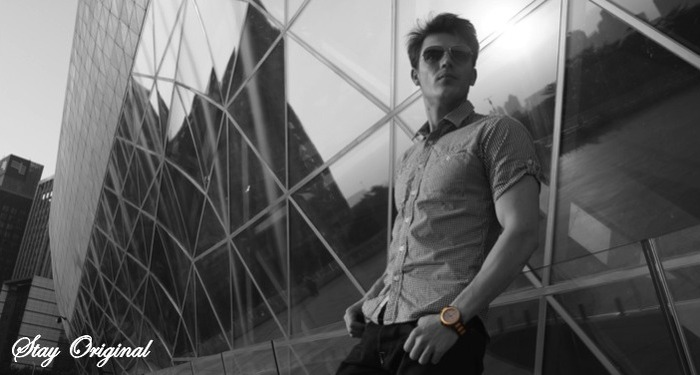 The company is known for its iconic Museum watch and its modern and eye-catching aesthetic. The iconic Museum watch dial is defined by a single gold dot that symbolizes the sun at high noon and the hands that symbolize the movement of the earth. The original Museum Watch by Movado designed by American designer Nathan George Horwitt in 1947 was the first watch to be displayed at the Museum of Modern Art. The watch was dubbed as “the only truly original and beautiful one for such an object” by rewnowned photographer Edward Steichen. Movado also commissioned the design and installation of “Time Sculpture,” which was designed by architect Philip Johnson, and is located outside Lincoln Center in New York City. Today, Movado has more than 100 patents and 200 international awards for its innovation in design and watch technology as well its unique artistry. Movado celebrated its 125th year of watchmaking in 2006 and is still going strong. The simple and elegant features often observed in Movado timepieces can be seen in its ESQ One collection as well. This unisex watch has a very cool and fun vibe. It comes in 12 different models, which include orange, white, yellow, navy, black, turquoise, fuschia and combination of these colors. The colors are vibrant and eye-catching and very fashionable. 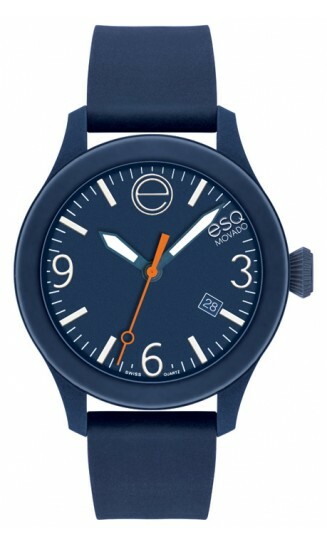 The ESQ One comes in a silicone-wrapped steel case that is 42.5 millimeters in diameter. It has a screw-down polycarbonate crown and a soft silicone strap with a unique logo-button that match color of the case. The case is water resistant to 10 ATM. 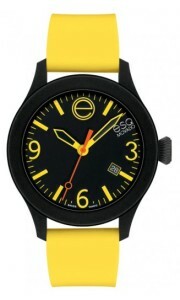 The dial comes in various colors depending on the model of the watch. The Arabic numerals on the three o’clock, six o’clock and nine o’clock positions are pretty prominent and easily legible as are the indices on the others. There is a date window at the four o’clock position as well. 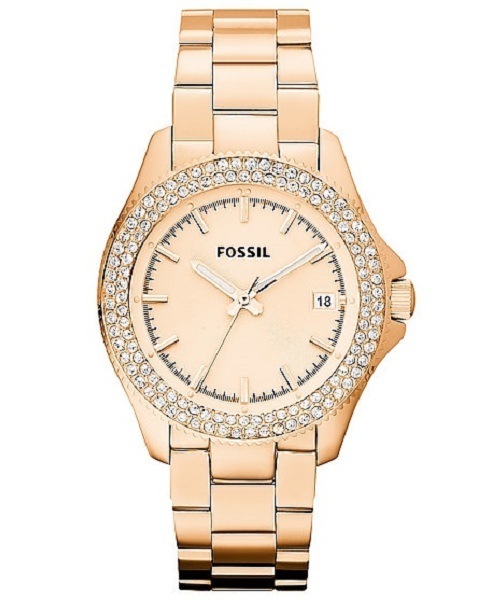 Fossil History: Founded in 1984, Fossil is one of the most popular brand names in the United States. The brand designs and markets fashion watches, leather goods, sunglasses, and other items throughout the world. The brand grew as its watches became popular in the 1980s with their “retro” design style. In the 1990, the company expanded their product line to include its other ventures mentioned above, including jewelry, and went international. In 2001, the brand obtained the company Zodiac, a Swiss brand that allowed Fossil to establish a Swiss presence. Fossil offers vintage watches with undeniable charm and one-of-a-kind feel. These chic watches have attractive designs and come at very affordable prices. Fossil offers hundreds of watches to choose from. The watches range from fun and flirty to elegant and sophisticated. They come in various sizes and shapes to fit your mood and style. It is just the right time to check out these trendy watches. 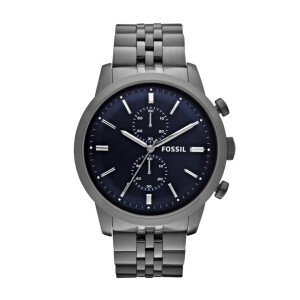 Fossil has collections for both men and women that include titanium, chronograph, Twist and multifunction. Today, Fossil has many brands and designs that it manufactures and distributes, including Burberry, DKNY, Emporio Armani, Columbia Sportswear, Diesel, Frank Gehry, Philippe Starck, Michael Kors, Callaway Golf, Davis Cup, Marc Jacobs and Adidas. Belgian watchmakers Ice-Watch and BMW Motorsport have officially linked up as partners for the 2013 BTM season. Ice-Watch will have an emblem on the body, roof, and hood of the #21 Ice-Watch BMW M3 DTM racing car. As the “pinnacle of touring car racing,” according to the DTM (or “Deutsche Tourenwagen-Meisterschaft”) website, the series is considered not only one of Germany’s but Europe’s most prominent annual sporting events. Jens Marquardt, BMW Motorsport director, was enthusiastic about their new Premium Partner. “We are pleased to be working with a partner like Ice-Watch, which sets new trends in its industry and has a dynamic image,” Marquardt said. Now let me introduce you to the face of this colossal partnership: Marco Whittman. While BMW was recently expanding its team to eight, Whittman got signed onto Team MTKE as the seventh DTM driver for the 2013 season. At only 23 years old, Whittman is the team’s youngest driver. Ice-Watch is a Belgian company and is only six years old but already sells timepieces in over 100 countries. With its 29th anniversary approaching, the DTM series isn’t that much older than the driver of the new Ice-Watch BMW M3 DTM. 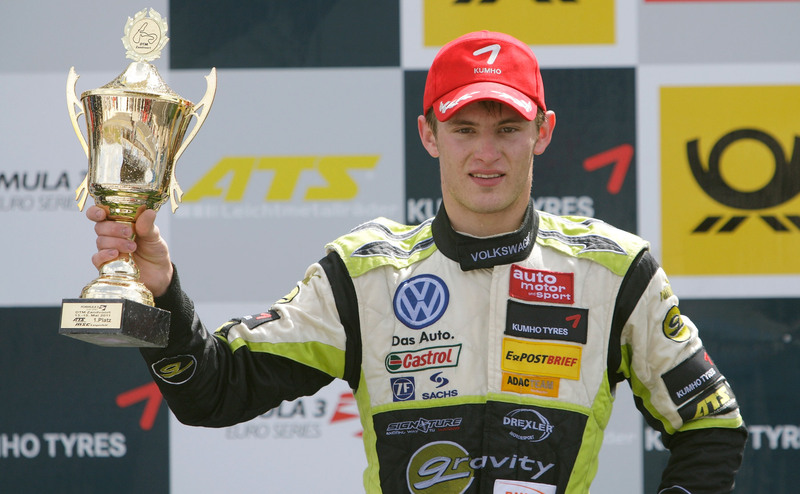 “The very first time I saw the design of my DTM car for 2013, I fell in love with it,” Whittman said. For BMW Motorsport and Ice-Watch, the track ahead looks bright in the glistening sunlight. “I’m sure we’ll see these amazing models on the wrists of many of the races in the DTM season in 2013,” Marquardt said. 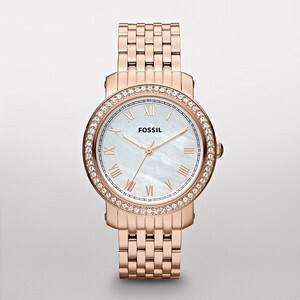 If your special someone neglected to deliver roses on Valentine’s Day, Fossil has a fabulous collection Rose Gold watches that’s sure to grant a reprieve of the heart, even if it’s only temporary. Any of these Fossil timepieces will complement your wardrobes and have it looking as sweet as rose. 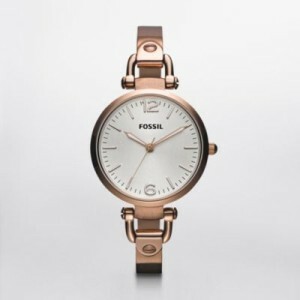 Fossil has capitalized upon designing beautiful rose gold tone watches that capture the spirit and sporty styling of elegance. A rose is still after all, a rose gold watch. With a cleanly designed analog face, the Victorinox Swiss Army Night Vision is a stainless steel quartz piece that is elegant enough a watch to wear during both day and night. But it is by far much cooler at night. Integrated into the case is a clever and flashy illumination system comprising a colorful trio of low-energy but extremely bright LEDs. 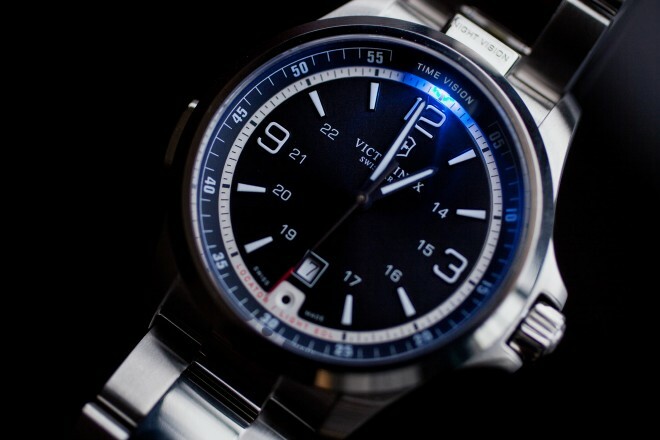 A light press of the side button of the watch turns on a blue LED glow that lights up the watch face. Push the same button two times rapidly and the second, white LED on the outside perimeter of the watchcase bursts to life. This is flashlight mode, aptly named for it is just as powerful as a home flashlight. 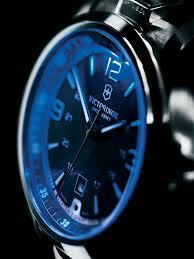 Victorinox even boasts that the white light is visible up to one kilometer away. Perfect to show-off if you happen to work a night job. Through the control button, the white LEDs are also able to go into an emergency strobe mode, where they flash quickly, and can continue to do so for up to seven days. Though obviously designed with more dire circumstances in mind, it would be a comforting thought if lost on a dark night to know your Victorinox light source will not fail. The third LED is a red pilot light at the 6 o’clock mark, right below the date indicator. Blinking at 10-second intervals, its function is to help you find the watch in pitch dark. But if the constant blinking gives you a headache, the feature can be deactivated with five rapid presses to the button on the left side of the case. 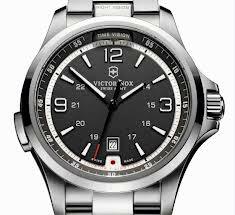 The Victorinox Night Vision is Swiss-made with a 41mm diameter stainless steel case holding the analog quartz movement. The triple-coated anti-reflective sapphire crystal is scratch-resistant, and the piece is water resistant to 50m (165 FT). Luminous polished silver-tone paint illuminates the hands and numbers for night mode, as well as flashlight. The screw-in case back is a rubber and steel combination case with a genuine black rubber strap and an end-of-life battery indicator. The LED features include Swiss-developed and Swiss-made low consumption light module with three different light sources. The first is a white LED flashlight (continuous light, signal and strobe functions); the second is a blue LED for dial illumination; and the third is a red LED multifunctional light pusher (locator and EOL indicator). With white or black dial and either stainless steel or leather strap, this eye-catching chronograph comes in at a reasonable $550 in the US. Another unique feature of the Victorinox Night Vision, is that it is powered by two batteries. One is used to power the Swiss quartz movement that tells the time and date, and the other battery (a 3 volt lithium 2032 cell) is there solely for the LED light functions. The Victorinox Night Visions were also tested with a German team on a recent Siberian Black Ice Race. According to the team, the timepieces went above and beyond in both illumination and location finding during the nights of absolute dark on the tundra. Notably, the watches also held up in temperatures as low as -40 degrees Fahrenheit. However, for a dress/causal sport watch, its average owners probably won’t be trekking across Siberian tundra. For $695, it’s a classy watch with an impressive flashlight that doesn’t come out looking too bulky or strange. A fun pick for both adventurers and/or someone who tends to lose things in very dark corners.